Thomas Penson junior is usuaully remembered for his road bridges in Wales, where he was County Surveyor for Montgomeryshire and Denbighshire for many years. However, his prolific output as an architect, civil engineer and surveyor includes buildings of all kinds as well as bridges. He was part of an engineering mini-dynasty that consisted of his father, Thomas Penson senior (1760-1824), and two of his sons — Richard Kyrke Penson (1815-85) and Thomas Mainwaring Penson (1817-64). Details of Penson's early education are unknown, but he did become a student of renowned Neo-classical architect Thomas Harrison (1744-1829). 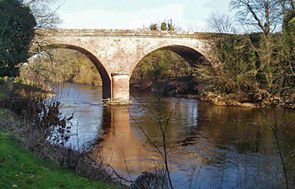 Harrison's influence on Penson's bridge schemes is clear, particularly in relation to Llanymynech Bridge (constructed 1826-28) and Long Bridge at Newtown (1827, extended 1857). Penson's work also reflects the design philosophy of Thomas Telford (1757-1834), who worked in north Wales and was Surveyor of Public Works in neighbouring Shropshire. 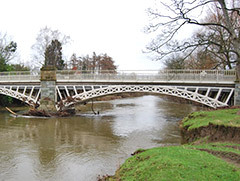 One of Penson's first recorded projects was the rebuilding of Overton Bridge on the River Dee south of Wrexham. In August 1813, the single-span masonry bridge that his father had been constructing collapsed. Penson senior was dismissed and, supervised by architect John Carline II (c.1758-1834), his son took over, realising the double-arch sandstone crossing we have today. Penson worked with materials other than stone, such as cast iron and terracotta, and the wide range of his projects demonstrates his versatility as an engineer. He worked on more than 30 buildings — including seven schools, seven churches, goals, workhouses and residential buildings — and at least 36 bridges, new and reconstructions. His cast iron bridges at Llandinam (1846), Abermule (1852-53) and Caerhowel (1858) exemplify Telford's principles. As County Surveyor for more than 40 years, his schemes contributed significantly to the improvement and general development of road links in mid and north Wales. He held public office — as Mayor (1840) and Alderman (1841) of Oswestry in Shropshire, close to the Welsh border, and as Deputy Lord Lieutenant of Denbighshire (1852). 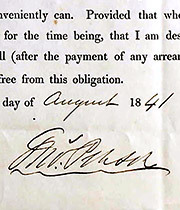 He was also a Member (equivalent to a Fellow today) of the Institution of Civil Engineers, and a Fellow of the Royal Institute of British Architects (1848). 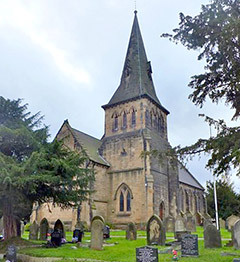 Fittingly, after his death in 1859, he was buried in the grounds of Holy Trinity church in Gwersyllt near Wrexham, which he had designed in 1850-51. 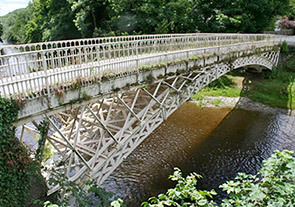 His last project, the masonry Cilcewydd Bridge in Powys was completed posthumously in 1861 by his son Richard. 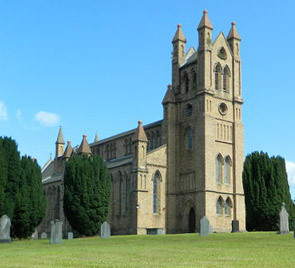 Holy Trinity church, Gwersyllt near Wrexham, was designed by Penson in 1848 and constructed 1850-51. It is also Penson's place of burial (1859). The present Caerhowel Bridge (1858) over the River Severn was designed by Penson to replace a taper-chain suspension bridge by James Dredge senior (1794-1863), which collapsed in 1858, killing one person. It has two equal spans of 22.1m, and was strengthened for highway loading in 2004. Grade II listed. 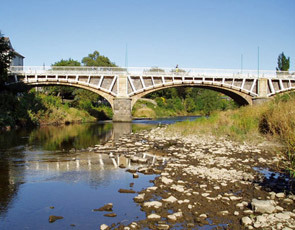 Cilcewydd Bridge, designed by Penson and completed by his son Richard Kyrke Penson in 1861, two years after Penson's death, carries the A490 over the River Severn on four masonry arches. 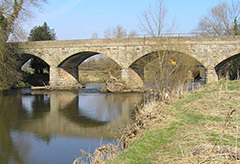 Grade II listed Overton Bridge (1816) near Wrexham in Wales was begun by Penson's father but collapsed in 1813 while under construction. Penson took over, supervised by architect John Carline II (c.1758-1834). Penson's Long Bridge (1827) in Newtown, Powys, is also now Grade II listed. The white cast iron arches were added by him in 1857 to enable the widening of the carriageway. St David's (1847), Newtown, Powys — one of seven churches designed by Penson. Constructed in brick in the Victorian Gothic style, it it is now Grade II listed, though it closed in 2006. Grade II* listed Llandinam Bridge (1846) is the earliest of three cast iron bridges by Penson over the River Severn. It's three-rib segmental arch spans 27.4m. 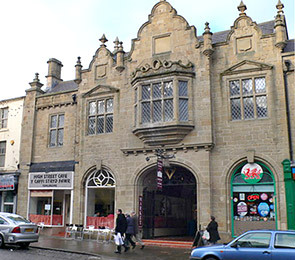 The Butchers Market (1848) on Wrexham's High Street — a 19th century neo-Jacobean 'superstore'. Now Grade II listed.